The demand for rental properties has risen during the post-earthquake rebuild. Workers and families are desperate for practical living solutions but the competition is huge. With many Cantabrians moving back to Christchurch and more rebuild workers arriving every week, accommodation is fast becoming a serious issue. With higher demand of course, rents have been going up in some areas. 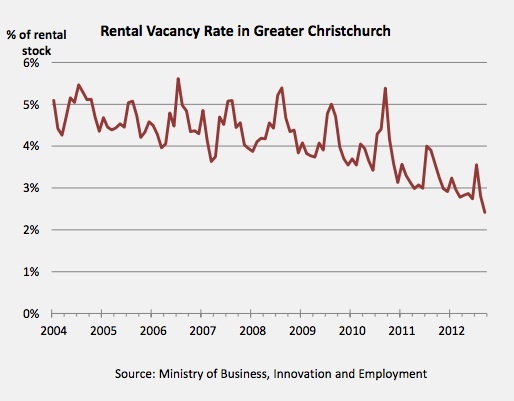 The Ministry of Business, Innovation & Employment has just released its Key Canterbury Indicators document that shows a decline in rental vacancies. The government has established temporary housing and homeowners have previously been encouraged to offer accommodation to incoming engineers, builders and other workers as single boarders. There’s no denying that the past few years have been tough. However, there is light at the end of the tunnel and the rebuild is well under way. The Key Canterbury Indicators document above notes that the number of dwellings consented in Christchurch City was up compared to a year ago, which is encouraging: “Consents were issued for 369 new dwellings in Canterbury in June 2013, compared with 296 in June 2012”. Despite a shortage, Cowdy have some great properties up for rent at good prices. If you don’t find what you’re looking for then give us a call on (03) 355 6686 and we can actively look for you. If a move out of Christchurch temporarily is on the cards for you, then why not look into listing your house as a rental? We can manage the whole process for you so all you need to do is watch the rent come in! With a market desperately needing new properties to rent, you’re not just making a smart financial decision but also doing your bit to help Christchurch get out of the accommodation shortage. Follow us on Facebook! We’re always keeping our fans up to date with local property news, maintenance tips, interior design ideas, latest listings, and posting some of the most creative properties from around the world!